I think this is a brilliant bit of advertising. A little bit of science fiction, light humour and a subtle message all in the name of encouraging people in through the doors to burn off some of those excess kilos. Sadly, this is Britain after all, and someone didn't see it for what it is and took offence and complained. 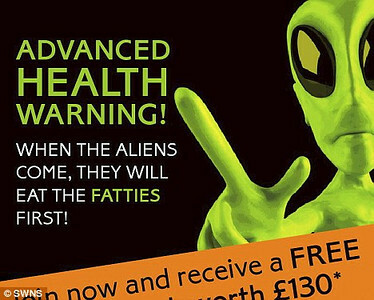 Apparently it's offensive (to fatties of course) and conveys a negative message (yup, the aliens ARE coming ;-) ) which "will not encourage people to join the gym". Come on people. Get over yourselves. See this for what it is: a clever bit of advertising and haul your fat arses into the gym. Quickly, before the aliens pop by and gobble you all up. Now I've got that off my chest, I'm heading down to the gym - I don't want to be alien dinner.